The Model 200/250 is a cost-effective and durable solution for your low to medium speed Registration Control applications (up to 400 RPMs). 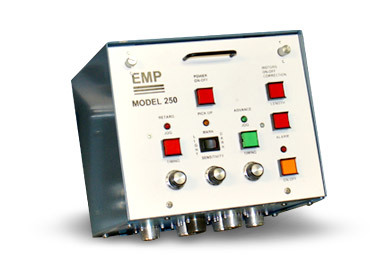 The EMP Model 200/250 is the control panel for all of our Transmission-based Registration Control Systems. Based on input from the Selector Switch and Scanner, the Model 200/250 determines if the web is too far advanced or retarded. It then sends out the appropriate correction to our Transmission. Durable and easy to maintain, the Model 200/250 has been a popular choice for factories worldwide for the past 25 years. Based on your operating needs, we recommend either a Model 200/250 system or the Series 1100 Servo system. FAQ: What is the difference between a Model 200 and a Model 250? EMP's Model 250 Dual Motor and Model 200 Single Motor are affordable and reliable controllers for motor registration systems with varying levels of automation. The Model 250 Controller is designed to operate with a dual-motor transmission, such as our Double Differential, to automate Phase and Length corrections. The Model 200 utilizes a single motor to automatically make Phase corrections while requiring an occasional manual adjustment for Length corrections. Out of Tolerance Alarm – Within the active area of the selector switch, an electronic zone referred to as the Electronic Vane (EV) is created. If the register mark is detected within the EV zone, the registration is within tolerance and no alarm condition exists. If the register mark appears outside the EV Zone, an Out of Tolerance condition exists and the alarm relay is activated. The Alarm Relay is rated at 2AMP, 120 Volts AC and can be used to energize an alarm of Programmable Controller. An EV Adjustment Knob is provided for setting the EV Zone to meet your requirements. This circuit can also be programmed to activate the alarm after 1,4,8,16 or 32 out of tolerance conditions have been detected. Advance and Retard Indicators – Advance and Retard lamps indicate the active regions of the Selector Switch. Improved Scanner Circuity – Designed to sense a wide range of colors while maintaining a high level of immunity to EMI. Front Panel Controller – The decision maker of the system, it contains the electronic circuity, as well as the indicators and adjustment controls necessary for proper operation. Selector Switch – Used to provide a signal to the Controller, indicating the position of the knife. The Selector Switch is normally geared 1:1 to the knife. When the rotary knife has 2 or 3 blades, the switch could be geared 2:1 or 3:1. Scanner - Detects the edge of the registration mark and notifies the controller. Transmission - Based on your desired level of automation and accuracy, we will either recommend a Double Differential or and Inline Differential.